On October 26, 1934 Claude Neal, a black man accused of murdering a young white woman in Jackson County, Florida, was dragged from his jail cell to be lynched. The event was rushed into the afternoon newspapers. 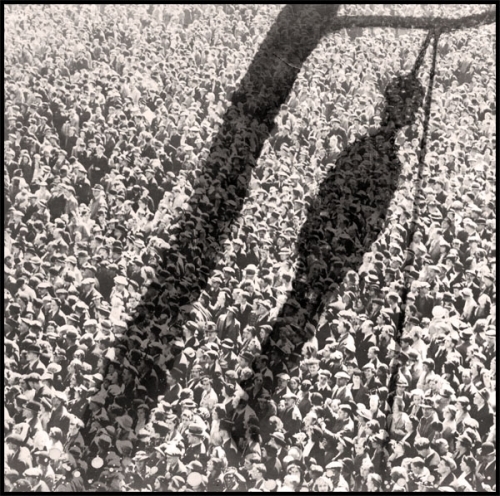 When an unruly crowd of several thousand people gathered for the spectacle, the six men in the lynching party got nervous and decided to drive Neal to a secluded spot in the woods. There they tortured him in ways that seem impossible for a human being to imagine. America can rightfully feel better about itself now, having gone beyond such detestable acts of savagery against fellow human beings. But the assault on people deemed inferior continues in another way. Instead of a single shocking act of physical brutality, it is a less visible means of drawn-out terror that destroys dignity and livelihood and slowly breaks down the body. So insidious is this modern form of economic subjugation that many whites barely seem to notice people of color being dragged to the bottom of one of the most unequal societies in the history of the world. For every $100 of median wealth owned by white households in 1984, black households owned $9. In 2011 they were down to $7. Hispanic workers, who in 1979 made 81 cents for every dollar made by white workers, are now down to 69 cents (Fig C-2, Median). After the recession they lost two-thirds of their household wealth because of plummeting home prices and foreclosures. Unfathomable wealth has been created since the recession, about $25 trillion, a full third of the total wealth in our country today. The overwhelmingly white richest 10% took almost allof it. Those of us who should be subject to a wealth tax or a financial transaction tax continue to benefit from a stock market that offers almost nothing to hard-working, low-income minorities. The conservative solution for poverty is “get a job.” But stunningly, over half of the black college graduates of recent years were underemployed in 2013, working in occupations that typically do not require a four-year college degree. Along with their sub-living-wage jobs, they have an average of almost $30,000 in student loan debt. It seems it couldn’t get worse for them. But it does. A 2003 study found that white job applicants with criminal records received more favorable treatment than blacks without criminal records. Today the degradation of minority human beings is subtle and civilized, with life-altering or deadly effects that can’t be traced to a lynch mob. The infant mortality rate for African-Americans is double the national average in a country that is already near the bottom of the world’s industrialized countries. If the newborns get past infancy, they start life in an America in which almost half of black children under the age of six are living in poverty. Properly funded public education would improve the lives of the poor. Numerous studies have shown that with pre-school, all children achieve more and earn more through adulthood, with the most disadvantaged benefiting the most. But Head Start was recently hit with the worst cutbacks in its history. Spending on K-12 public school students fell in 2011 for the first time since the Census Bureau began keeping records over three decades ago. When black children in America finally get to school, they enter classrooms that are more segregated than in 1970, and in which two-thirds of their classmates are low-income. All this despite mounting evidence of the importance of integrated schools for all children. In “The New Jim Crow,” Michelle Alexander documents the explosion of the prison population for drug offenses, with blacks and Hispanics the main targets even though they use drugs at about the same — or lesser — rate as white Americans. Each inmate in a modern-day private prison, according to Chris Hedges, “can generate corporate revenues of $30,000 to $40,000 a year.” Private prisons sell inmate labor to corporations like Chevron, Bank of America, AT&T, and IBM. Nearly a million prisoners work in factories and call centers for as little as 17 cents an hour. Many reputable studies have documented the link between financial stress and illness, and between economic status and longevity. The sickening — or deadly — effect of poverty among minorities is manifested in numerous ways. The very poor breathe dirtier air; they are less likely to have health insurance; they are three times more likely to be victimized by crime; they suffer stress loads that make it much more difficult to work themselves out of poverty; in Detroit, where payments to Wall Street are approaching a half billion dollars, thousands of black residents aren’t even getting water. The good people of today would look up from their stock portfolios and shake their heads in disgust.